Majallah-i al-Falah January 1935. A monthly journal about Islamic and legal issues. 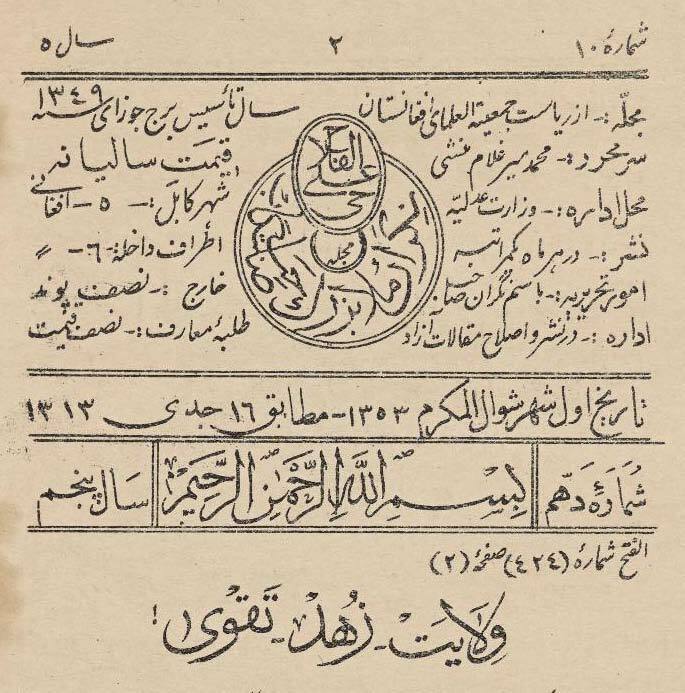 The Middle East Materials Project (MEMP) has preserved nine Afghan serial publications collected by the Library of Congress Field Office in Islamabad. Three of the publications have been digitized and the other six are now microfilmed, as indicated below. These materials include holdings from 1930 through 2011 and represent a period covering the last years of the monarchy's rule in Afghanistan, civil war, foreign invasion, and the rule of the Taliban. Most are in Persian (Farsi) and/or Pushto language, but some also contain English language content. The range of titles includes general newspapers as well as the publications of political organizations and governmental bodies. Several of the titles are devoted to women's and children's issues. This collection complements a number of other Afghan materials recently preserved by MEMP and SAMP.